Apple's next-generation iPhone display assembly has seemingly once again been leaked via sources within the Asian supply chain, lending credence to previous leaks but still revealing little about the technical makeup of the so-called iPhone 6s. 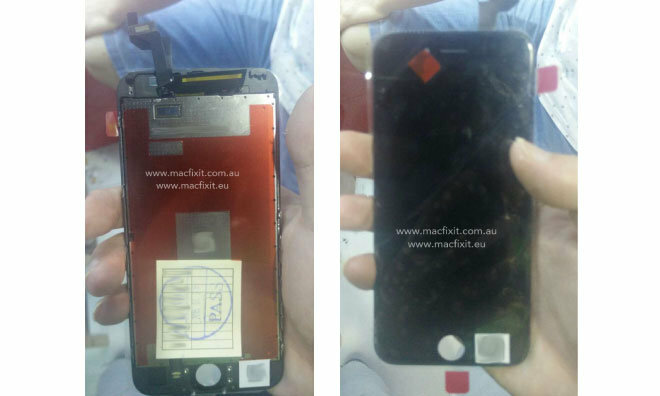 The new images, first published by Australian website Macfixit mirror those seen previously with an assembly that superficially matches that found on the iPhone 6. The cover glass comes with rounded edges, and sensors appear to be located in roughly the same positions as the current model. Unfortunately, many of the interesting parts are covered with metallic shielding, thus yielding little in the way of insight into what, if any, technical changes have been made. There is no way to tell, for instance, whether the assembly incorporates additional sensors for Force Touch, as has long been rumored. The shielding does appear to be riveted, a different construction technique than previous models, but the reason for the shift is unclear. With the iPhone 6s launch likely to come sometime in September, leaks of smaller parts— like ribbon cables— have also ramped up. Most of the leaks point to a typical "s-type" upgrade, in which internals receive slight bumps while the iPhone's external design remains for all intents and purposes unaltered. Apple is expected to debut its new A9 processor with the iPhone 6s, and the new handset could move to 2 gigabytes of RAM and add a rose gold color option in addition to Force Touch. Manufacturing for the latter modules is rumored to have already begun in volume.